Bent fork, is it replaceable? I got into an accident on my Raleigh Revenio 1.0 nearly 5 years ago. I've ridden it 400-500km since then with no problems. I don't see any damage to my top tube, down tube, or head tube. It turns out that I bent my fork, but I didn't know that until just last week. Can I get this replaced? My LBS guy says it's some kind of integrated system that is out of date now. Also, the bike is American and I'm in Europe. Maybe I can get a replacement more easily in the USA? How dangerous is this to ride? 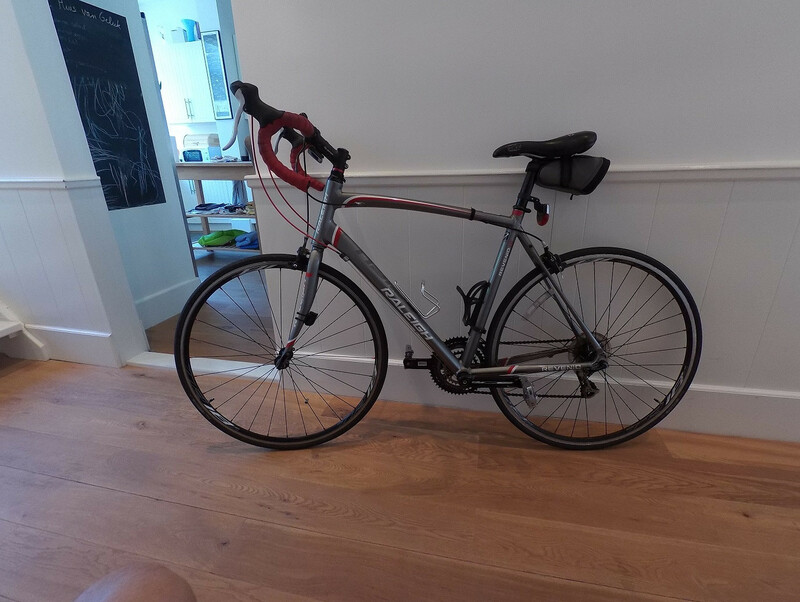 I have a race (triathlon with 40km bike) in 2 weeks and I'm hesitant either to switch bikes now (plus I'm kinda broke) or to use a rental for the day. I know tons about swimming and running (coached both for many years), but next to nothing about cycling, so any help will be very much appreciated. I know my bike is a 56cm frame, but beyond that I'm a novice. Thanks for any help you can provide. First, there is some danger that the fork could fail catastrophically. But if you are religious about inspecting the fork for cracks on a regular basis (and taking action of some sort should a crack appear) then the danger of this is low. Second, having the wheel pushed back reduces your toe clearance, which can result in nasty spills if your toe hangs up on the wheel. But there are many bikes designed with less clearance than yours, so this is a personal choice kind of thing. Third, and possibly most significant, the damage affects the delicate geometry -- the "rake" and "trail" -- of the front wheel. This affects handling and stability in subtle (and not so subtle) ways. But if you've been riding the damaged bike for 5 years and not noticed this you've either become accustomed to this or the effect is not strong enough to worry about. The bike looks like a reasonably popular one in the US, though I can't say about the specific model. It's possible you could find a damaged one to scavenge parts from, but you'd have to be sure the "donor" bike did not have front end damage. Fork blades do like like they have been pushed back. This effectively reduces the offset (perpendicular distance between steering axis and wheel axle), and increases the trail (how far behind where the steering axis intersects the ground the wheel contact patch is). If the steering does not feel weird to you, and you are always in control of the bike then it's not dangerous. This will depend on how fast you are riding though, problems may show up at higher speeds, or under harder braking. Generic replacement forks for road bikes are available - obviously it's not going to match the paint scheme but a black one should look OK. There should be no problem being in Europe vs. the US. The vast majority of bikes and components are made in the Far East for a global market. Raleigh is putatively a British brand anyway. The head tube is not tapered so the fork very likely has a standard non-tapered 1​1⁄8" / 28.6mm steerer tube. [EDIT appears I'm wrong about this, see @Mike's answer]. An issue may be the headset bearings which appear to be an internal type. I think this is what your mechanic is referring to. 'Out of date' does not mean 'not available' though. You may not even need to replace the headset bearings. I'd consult with some other repair shops and get them to explain exactly what is required to replace the fork. Answering your first question: I did a quick search and it seems that some Raleigh Revenio have so called tapered head tube (the top bearing is then 1 1/8" and the bottom bearing is 1.5") while others should have a standard 1 1/8". There are front forks for tapered head tubes are to be sourced in the Netherlands for under 100 euro (carbon, just checked) and for 1 1/8" are even cheaper. Nevertheless, disassembling and measuring all the parts gives the most accurate answer. The replacement itself should take not more than half an hour (own experience) provided that nothing else is damaged. What part of the Netherlands are you located in? Perhaps I can help? Good luck with your triatlon! I do not advise you to drive like that, it's dangerous. It is better to replace the bent plug with a new one. Not the answer you're looking for? Browse other questions tagged road-bike fork front or ask your own question. What maintenance does a front suspension fork need? Is it safe to ride with bent fork? Can a bent hub damage my fork? 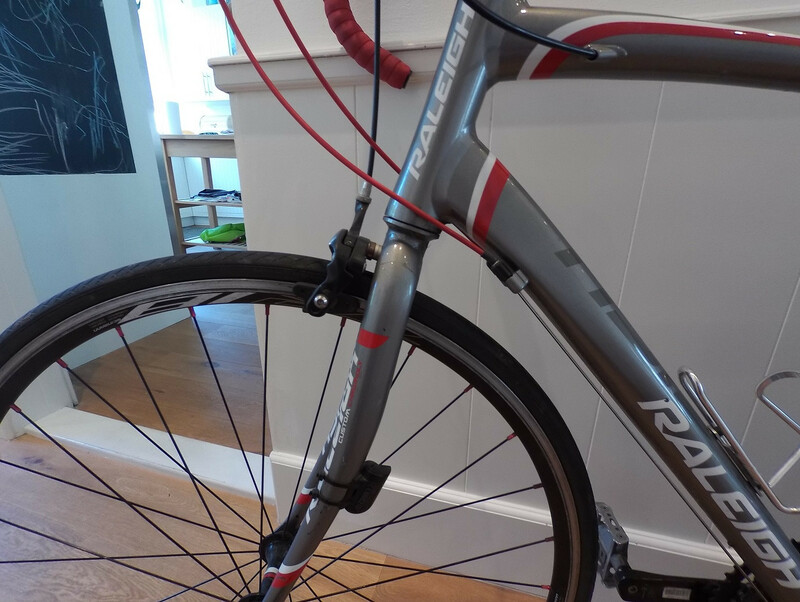 What are my options for correcting a bent aluminum fork? Can this bent (after crash) rigid steel fork get repaired? Fork bent on a flat pack bike - what to do?